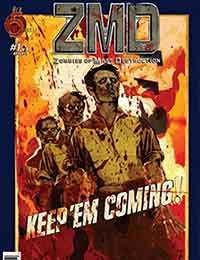 ZMD: Zombies of Mass Destruction Average 0.00/5 - out of 0 total votes. With public patience for Middle East casualties wearing thin, the U.S. military adopts a new weapon... zombies. Air-dropped into hot zones, the walking dead indiscriminately infect everyone. Engineered to dissolve at daybreak, they create a safe combatant-free zone. What could go wrong? From the creator the of UNDERWORLD movie franchise.